Ticket Collectors or Ticket examiners are the permanent employees of the Indian Railway who are employed for checking the tickets of the railway passengers. The Indian Railway sets the pay scale of the ticket collectors as per the central pay commission of the central govt. employees. The rank of the Ticket collectors is termed as TTE i.e. Travelling Ticket Examiner. They travel along with the train and are also deputed in the platforms to verify the tickets of the passengers. The TTEs have the authority to penalize the passengers travelling without valid ticket in Railway compartments. Apart from their regular salary, they get several allowances and over time bonus from the Govt. As of now, the ticket collectors / examiners are receiving their salary and other benefits as per the recommendations of the existing central pay commission. The existing pay commission is the 6th pay commission which was implemented in the year 2006. 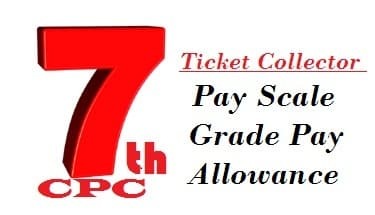 The pay scale and increments of the ticket collectors are currently decided as per the 6th pay commission. The rank of the ticket collectors or the TTEs belongs to the Pay Band 1 of the pay structure. The existing pay scale of a ticket collector is Rs. 5,200 – Rs. 20,200. In addition to this, a grade pay of Rs. 1,900 is applied to the salary. So the total basic salary of a ticket collector becomes Rs. 7,100. Apart from the pay scale and the grade pay, they get several other allowances and benefits from the Govt. which further increases their salary. The most important allowance they get is the Dearness Allowance (DA). At present, the rate of DA provided by the central govt. to its employees is 125 % of the basic salary. Apart from this, they get 30 per cent HRA in case of posting in big cities and 10 per cent HRA in case of other postings. Travelling allowance, overtime bonus, night duty allowance, medical allowance, etc are some other allowances and benefits, the ticket collectors get. After the implementation of the new pay commission i.e. the 7th pay commission, the salary structures of all the ticket collectors will get revised. The date of implementation of the 7th pay commission is 1st Jan 2016. Several recommendations regarding the revision of the salary structures of the govt. employees are made. As per the recommendations of 7th pay commission, the Pay Band of the ticket collectors will remain the same i.e. Pay Band 1. However the existing pay scale is expected to get revised to Rs. 15,600 – Rs. 60,600. And the grade pay which is currently Rs. 1,900 may become Rs. 5,700. But the DA will be zero again. The existing rate of increment every year on the basic is 3 per cent, which will not get altered in the new pay commission.